Angiodysplasia of the colon occurs when blood vessels in the colon (large intestine) enlarge. They may become fragile and result in occasional bleeding in the gastrointestinal (GI) tract. Angiodysplasia of the colon is caused by dilated connections between veins and capillaries or arteries in the colon. Your blood and stool may be tested. Your doctor can often treat tissues with heat to seal bleeding blood vessels during a colonoscopy. Rebleeding is common. The blood supply to the bleeding area can be clotted through angiography. Medications called somatostatin analogs may be used to prevent bleeding in some people. 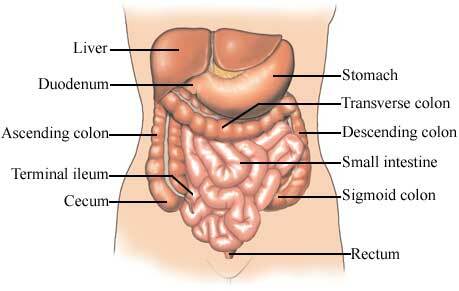 Surgery to remove the affected area of the colon may sometimes be necessary. There are no current guidelines to prevent angiodysplasia of the colon. Gastrointestinal angiodysplasia. EBSCO DynaMed Plus website. Available at: http://www.dynamed.com/topics/dmp~AN~T114051/Gastrointestinal-angiodysplasia. Updated July 14, 2015. Accessed March 16, 2018. 6/19/2014 DynaMed Plus Systematic Literature Surveillance http://www.dynamed.com/topics/dmp~AN~T114051/Gastrointestinal-angiodysplasia: Jackson CS, Gerson LB. Management of gastrointestinal angiodysplastic lesions (GIADs): A systematic review and meta-analysis. Am J Gastroenterol. 2014;109(4):474-483.